Typically, the husband and wife are grantors of the trust as well as its trustees. Trustees can treat the property in the trust as if it was their own. The death of the trustee automatically creates an estate comprising the property of the deceased. One of the intentions of the family trust is to avoid proving the will in court - probate. Upon a person's death, his or her estate is appraised and taxed at fair market value subject to the exclusion, currently $5.25M. This process is often referred to as a "step up" which resets the basis of the property and assets at that fair market value, in other words, there is no capital gain. The new estate also requires an EIN. As soon as someone dies, it is generally necessary to determine who will then own their property. This property is termed the Decedent's Estate. If there is a will, the will needs to be proved in court, a process called Probate. A trust is required to file taxes annually, while an estate is permitted up to two years from the date of death to file. An IRS Form should be filed to merge the family trust into the estate to give the parties more time to file their tax returns. The trustees of a Decedent's Estate have up to two years from the date of death to file a tax return for the estate. It is recommended that you use the same professional to file both the deceased's final return and the Decedent's Estate return. A simple trust has a calendar year and distributes all its income each year, but no principal. It has no charitable beneficiaries. A simple trust does not distribute principal in the tax year. A simple trust is actually a pass through trust. All income passes through the trust directly to the beneficiaries. 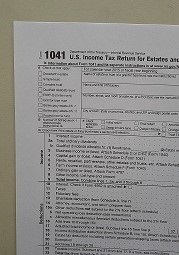 It is reported to the IRS on a K1 in order that the beneficiaries pay income tax on that income on their own 1040. A qualified disability trust is established for a disabled person aged less than 65. Allocations between principal and income are often governed by State law. For instance, a trusts accounting income may be set as 3-5% of the trusts assets. Trusts are often established to minimize taxes.